Want more such festive special treats? 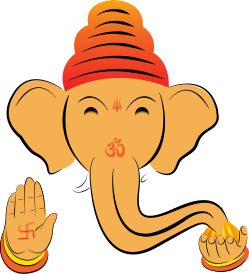 I treated my Ganesha with KAJU PAN. Mix 1 cup kaju powder, 2 tbsp milk powder, 1/4 cup sugar powder, 2 tbsp milk, green color and make the dough. Roll puri, make 4 cut and stuff it with Gulkand, chopped almonds and kaju. Fold in cone shape and finally garnish it with silver leafs. Instead of usual laddoos, I served my Ganesha with Blueberry & Rose Balls. Mix 1 cup desiccated coconut, 1/2 cup paneer & 3/4 cup condensed milk. Divide in 2 parts. Add blueberry crush in one part and add rose syrup in another part and make the peda balls. Roll in blueberry flavored coconut & rose flavored coconut. 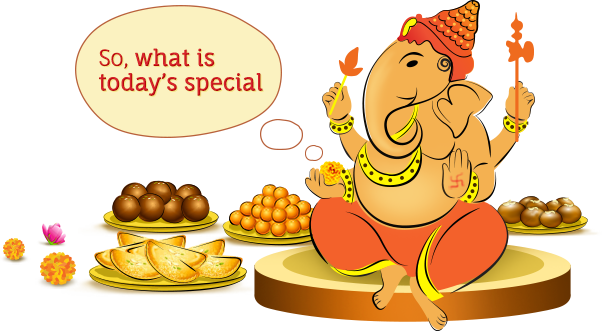 Serve to Ganesha as Bhog. I chose to surprsie Ganesha with an unusal version of laddop, Mawa Misri Laddoo. Mix 1cup khoya, 1/2 cup fresh coconut, 1/2 cup paneer, 1 cup sugar powder, 2 tbsp cream and mix well. Divide 4 parts as in divide 2 from each. Add in 1 part with different colour & essence. Make dual coloured balls and serve it as prasad. We made apple cranberry modaks for Ganesah ji. We made a filling of grated apple and soaked cranberries and cooked them with khoya and grated coconut and powdered sugar. I decided to made kesar modak for my Ganesha.. Boil 2 liter milk till it converted in to khoya. Mix some cardamom powder in khoya, 1 spoon kesar (soaked in milk). Mix dryfruit for stuffing. Take the kesar khoya, shape it like modak and garnish it with chopped dry fruit & kesar. I decided to cook something different this Ganesh Chaturthi, Chocolate Pan Modak. Take 2 tbsp coconut crush, mix 2 tbsp gulkand, add ready made pan and mix well. Make small pedas. Melt milk component in microwave and pour half in modak mold. Put one peda in it along with melted chocolate. Refrigerate it for 10/15 min. Un-mold in tray and finally serve. Instead of regular halwa, I prepared a healthier version by adding carrot to it instead of sooji. Simply chop carrot into small pieces and boil the same in the hot water. Then add 2 tsp sugar with kesari powder, add milk, badam, pista, yelakkai and garnish it with cashews. Instead of plain besan ke laddoo, I treated Lord Ganesha with an exotic version of besan ke laddoo. Take gram flour or besan roasted with ghee in a kadhai. Flavour it with sugar and cardamom and shape into tight round balls and garnish it with lots of almonds and pistachios. I made Pineapple Sooji halwa for Ganesha ji; We roasted sooji in ghee and took out the pineapple pulp and mixed them in khoya and added fried casjew nuts and pistas in it. I made a traditional bihari dish for bappa and its name is Doodh pithhi. Ingredients 1. whole wheat flour - 1/2 cup, Milk-1 liter, sugar-1/2 cup, 1/2 tablespoon Make a hard dough of wheat flour using water. Keep it aside for 1/2 an hour. After half an hour make oval balls of wheat like wheat grains and keep it in a bowl full of dry wheat floor so that they do not stick together. Now heat a pan and heat the ghee. After it gets heated, roast oval shaped wheat pieces for 3-5 min on medium flame. Boil the milk in a thick bottomed pan and add wheat pieces (pithhi). Cook it on low flame for about 1/2 an hour. Keep stiring and check with a spoon if pithhis have been cooked. If its cooked it will be easily cut by a spoon. Now add sugar and cook for another 5 minutes. When its cooked remove from flame and put a lid on it for 5 mintus and then it is ready to offer as a bhog to bappa. A unique recipe for my Ganpati Bappa is Paneer Puran Modak. For this, just mash cheese by adding milk, roasted Sooji, milk powder, saffron and knead it nicely. Make a ball of paneer & fill puran mixture (chana dal and jaggery paste) and give it a Modak shape and serve it to Ganesha. I made Bappas favourite steamed rice modak's healthy variation, Soya Modaks. Simply saute minced soya in 2 tsp ghee. Add jaggery, mix well and let it cool. Sprinkle a pinch of cardamom (elaichi) powder. Knead the dough with rice flour, 1 tsp oil, salt & water. Make modaks with the sweet soya mince filling and serve it. Today I offer an unusual laddoo to Bappa, and my family - Oats Gaund Ke Ladoo. It's yummy and uses edible gum to bring out its unique flavour. Here's the recipe. 3 tbsp edible gum (gaund) 4 1/2 tbsp ghee. 1 1/4 cups whole wheat flour (gehun ka atta) I cup oats 1/2 cup powdered sugar. 1/2 tsp cardamom (elaichi) powder. And ghee for deep-frying. Instead of usual motichoor laddoo, I decided to make a healthier version for Ganesha, Coconut Jaggery Laddoos. Simply grate coconut, add Jaggery and cook for 5 minutes. Keep stirring till it cools off. Make the peda balls of approx 1 inch. Cook rice flour in boiling water for 3 minutes. Cool it and cover the coconut jaggery balls with cooked rice flour using modak mould. Here's my version of modak. I have made it with coconut. Keep 4 cup coconut crushed and keep it in fridge for 3 hours. Take out it 15 min before cooking. In a pan take the grated coconut & 3 cup sugar and keep stirring. Let the sugar melt till it turns thick. Then add cardamom powder, a inch of yellow food colour, 2 cup of milk powder and mix it well. Boil 1 ltr milk, add white vinegar. Curdles will form, drain it in strainer. Squeeze the whole water from paneer. In non stick pan roast paneer with 1/2 Cup jaggery for 5 min at slow flame.Take it out in plate, let it cool down. Grind it in a paste. Make balls, garnish with almonds. I dedicate this special fried modak recipe to Ganesha. For outer covering, required items are 2 cups whole wheat flour, ½ tsp salt, 2 tsp warm oil, water to knead the dough for the inner filling, 1.5 cups grated or powdered jaggery, 1.5 cups fresh grated fresh coconut. Now shape it and deep fry it in hot oil. Serve it. This modak recipe is unique because it's quick to make and uses paneer in it. Simply mash 50 gm paneer with 50 gm milk powder add tbsp icing sugar to it. Now add grated 3 tbsp coconut and make a dough. Stuff the paneer dough balls with pan masala balls and shape them as modaks n serve. Instead of the regular kheer, I made special besan ki kheer with roasted gram flour, milk and a lot of dry fruits like cashew nuts, almonds and pistachios. I garnished it with kalonji. Here's my special recipe. For the filling mix 1/2 cup finely chopped candied fruit (pineapple & kiwi), finely chopped almonds, 1/4 cup khoya. For the outer covering, add a pinch of sugar to 1 cup rawa, pour 2 tsp hot oil & knead, rest it for 20 mins. Stuff this outer covering with 2 tsp of filling, shape it like modak and deep fry until crisp. Serve & enjoy. I used jackfruit seeds as the stuffing as they help cure indigestion, which is common during festive season. Mix jackfruit seeds with palm sugar and cardamom powder as the modak filling. Stuff rice flour dough with this filling and steam in dried biodegradable leaves (thonnai) to get that unique flavour. Instead of the everyday besan or boondi laddoo, I have made special sabudana laddoos for Bappa! I made Ganesha's favourite modaks, but with a twist. Instead of the usual coconut filling, I used puran (chana dal) as stuffing.